Iran manufactured missile. Illustrative. US Amb. 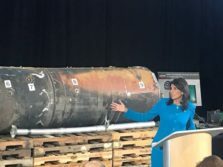 to UN Nikki Haley showing Iranian-made weapons used in Middle East conflict. Illustrative. Photo courtesy of UNITED STATES MISSION TO THE UNITED NATIONS. Iran retaliated on Monday against a group of terrorists in Syria for what the Iranians believe was their role in perpetrating the recent terror attack in Iran that killed more than two dozen, but even in that the Iranians still had reassert their hatred of Israel and the United States. According to the Fars News Agency, at least one of the six missiles fired by Iran into Syria had written on them the statements “Death to America,” and “Death to Israel”. Neither Israel nor the US are thought to be behind the attack and Monday’s Iranian reports in the Fars and PressTV media outlets do not directly blame Israel—claiming Saudi Arabia and the United Arab Emirates were at fault instead. This is not the first time that “Death to Israel” has been written on an Iranian missile, and it and “Death to America” are common chants in the Islamic Republic. Leaders in Iran have also repeatedly referred to Israel as a “cancer” and prophesied that Israel would be destroyed. This marks the second time in two years that Iran has launched missiles at alleged terrorists in Syria, and this time Iran escalated their offensive by following up with drone strikes as well. According to Fars, the missiles and the drone strikes were launched by Iran’s powerful Islamic Revolution Guards Corps (IRGC).